The Great Migration was the mass movement of about five million southern blacks to the north and west between 1915 and 1960. During the initial wave the majority of migrants moved to major northern cities such as Chicago, Illiniois, Detroit, Michigan, Pittsburgh, Pennsylvania, and New York, New York. By World War II the migrants continued to move North but many of them headed west to Los Angeles, Oakland, San Francisco, California, Portland, Oregon, and Seattle, Washington. 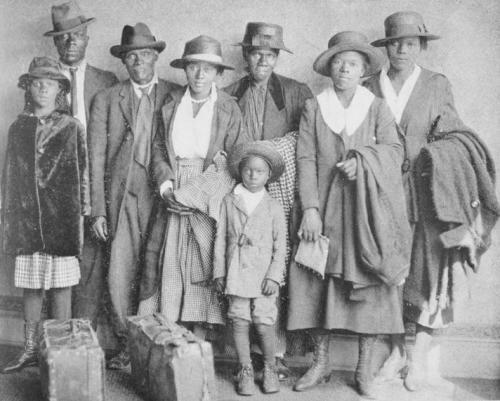 The first large movement of blacks occurred during World War I, when 454,000 black southerners moved north. In the 1920s, another 800,000 blacks left the south, followed by 398,000 blacks in the 1930s. Between 1940 and 1960 over 3,348,000 blacks left the south for northern and western cities. The economic motivations for migration were a combination of the desire to escape oppressive economic conditions in the south and the promise of greater prosperity in the north. Since their Emancipation from slavery, southern rural blacks had suffered in a plantation economy that offered little chance of advancement. While a few blacks were lucky enough to purchase land, most were sharecroppers, tenant farmers, or farm labors, barely subsiding from year to year. When World War I created a huge demand for workers in northern factories, many southern blacks took this opportunity to leave the oppressive economic conditions in the south. The northern demand for workers was a result of the loss of 5 million men who left to serve in the armed forces, as well as the restriction of foreign immigration. Some sectors of the economy were so desperate for workers at this time that they would pay for blacks to migrate north. The Pennsylvania Railroad needed workers so badly that it paid the travel expenses of 12,000 blacks. The Illinois Central Railroad, along with many steel mills, factories, and tanneries, similarly provided free railroad passes for blacks. World War I was the first time since Emancipation that black labor was in demand outside of the agricultural south, and the economic promise was enough for many blacks to overcome substantial challenges to migrate. In additional to migrating for job opportunities, blacks also moved north in order to escape the oppressive conditions of the south. Some of the main social factors for migration included lynching, an unfair legal system, inequality in education, and denial of suffrage. The great migration, one of the largest internal migrations in the history of the United States, changed forever the urban North, the rural South, African America and in many respects, the entire nation.